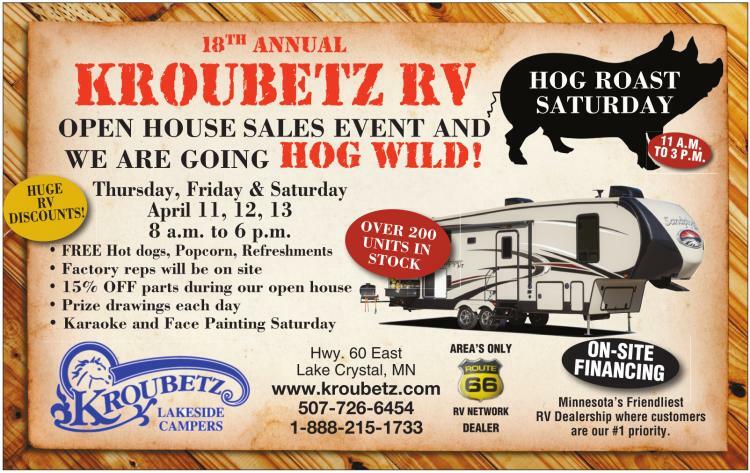 18 TH ANNUAL KROUBETZ RV OPEN HOUSE SALES EVENT AND WE ARE GOING HOG WILD! Thursday, Friday & Saturday April 11, 12, 13 8 a.m. to 6 p.m. • FREE Hot dogs, Popcorn, Refreshments • Factory reps will be on site • 15% OFF parts during our open house • Prize drawings each day • Karaoke and Face Painting Saturday Hwy. 60 East Lake Crystal, MN www.kroubetz.com 507-726-6454 1-888-215-1733 AREA’S ONLY RV NETWORK DEALER HOG ROAST SATURDAY Minnesota’s Friendliest RV Dealership where customers are our #1 priority. Thursday, Friday & Saturday April 11, 12, 13 8 a.m. to 6 p.m.
Minnesota’s Friendliest RV Dealership where customers are our #1 priority.